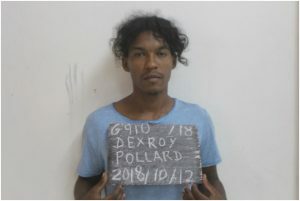 Dexroy Pollard, one of the three prisoners who escaped from the Lusignan Holding Bay, on the East Coast Demerara on October 15, is in custody, government’s Department of Public Information said. The 29-year-old Wales resident was recaptured by public-spirited citizens on the West Bank of Demerara on Thursday. Pollard was among the three inmates who escaped the Lusignan holding bay by scaling the wall. Murder accused, Travis Evans, age 23 of C field Sophia was the first to be recaptured. He was apprehended at the Linden Soesdyke Junction on October 19. Sudesh Dyal, 23 who was remanded for break and enter and larceny and escape from custody, remains on the run.